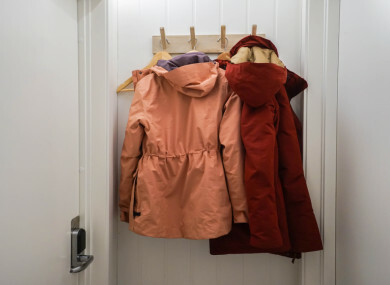 THE EASIEST AND most logical place to hang coats is in the hallway, because that’s where we take them off and put them back on again. However, nobody wants to have to push past a bulky mass of coats just to get through the front door. Owning lots of coats is something that goes hand-in-hand with living in Ireland, where we are often subject to four seasons in one day. So what’s the best way to store them if space is limited? Just because your space is tight doesn’t mean it’s a write-off; it just means you have to use it more efficiently. Some hanging hooks help to keep everything contained, and even better if there is a shelf above where you can place pretty baskets or hat boxes to store scarves and gloves etc. This beautiful train rack shelf from The Old Mill Stores in West Cork has an attractive vintage industrial look that really makes a statement. If wall space is restricted, think about how you can use your floor space more effectively. Coat stands are very clever way of exploiting even the tiniest of corners. There are budget options that are reminiscent of vintage styles, or opt for a modern look that even incorporates a hall table to hold other small items. One of the most widely ignored areas in our homes is the gap under the stairs – there’s oodles of space in there that can be taken advantage of. Smartstorage.ie has loads of options to make that most of that awkward triangular shape, including the Three Drawer Tall Boy which includes a hanging rail for coats as well as customised drawers to store shoes and bags. They also offer solutions for making the most of the eaves in a converted attic space. Even if you live in a bungalow, one thing every hallway has is a door! If wall and floor don’t have a spare inch to offer, then this is an area you can consider using for storage. You can find plenty of over-the-door hanging rails in any homeware or hardware store. Some even have flanges that slip over the top of the door, and therefore require no drilling or screwing. Think of ways to add storage options to any underused areas in your home. A space with massive potential is the hot press. Rather than cramming it with shelves full of bedlinen and towels that nobody ever uses, consider adding a hanging rail for coats. A wardrobe rail fixed in place with rail supports can convert your hot press – or any unused space – into hanging storage for coats. Something we could learn from our American friends is the benefit of including a so-called ‘mud room’ in our homes. This is essentially a drop-zone for shoes and coats, with hanging hooks and shelves arranged above a bench with storage underneath. A mud room area is often incorporated into a utility room. You could have one custom-built to fit your space, or see Littlewoods Ireland for this ready-to-go version that would look good in any room in the house. Email “Where should I hang the coats if my hallway is tight for space?”. Feedback on “Where should I hang the coats if my hallway is tight for space?”.